This Patricia Urquiola designed oven has 14 functions to experiment with, allowing you to cook any recipe to perfection. Cleaning your oven can also be effortless, thanks to our self-cleaning pyrolytic function that burns away stubborn dirt and grease at 480°C. Alternatively, opt for the eco-pyrolytic function for a faster and more energy efficient self-cleaning programme. With 14 functions to experiment with, you can make a lasting statement at the dinner table, whatever you’re cooking. Discover the true taste of Italy using the tailored pizza function, or bake the perfect poppy-seed cake with the help of our professional 3D cooking setting. 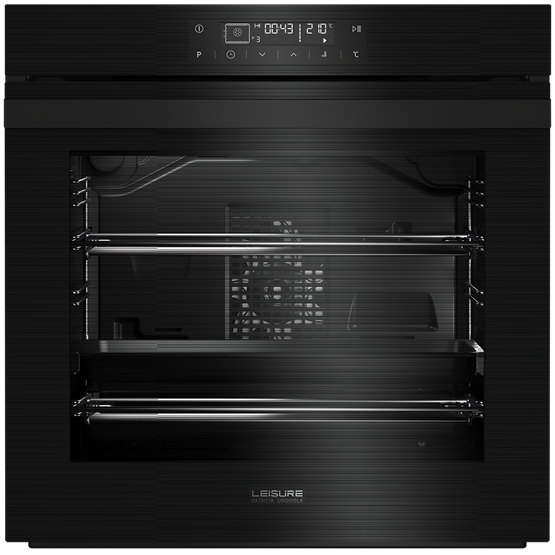 The pyrolytic self-cleaning function heats up the oven to 480°C, burning away stubborn dirt and grease. For truly effortless cleaning, this can afterwards be simply wiped away, with no scrubbing or scouring required. Increasing your cooking capacity doesn't always mean sacrificing kitchen space. With a capacity 15% larger than the standard oven, the 82L oven still occupies the same amount of space, meaning you can cook a larger meal without impacting on your kitchen space. Like a true aspiring cook you can view, pinpoint and select the perfect cooking temperature. And, if you’re not sure which shelf to use, the oven can advise you based on the selected setting. Say goodbye to the sound of slamming oven doors; the special hinges allow you to close the door softly and quietly.